This article is about the Alfa Romeo 1750 Berlina & Alfa Romeo 2000 Berlina sedans. For the 1750/2000 GT Veloce Coupe, see Alfa Romeo 105/115 Series Coupés. For the 1750/2000 Spider, see Alfa Romeo Spider. The Alfa Romeo 1750 Berlina and Alfa Romeo 2000 Berlina (both 105 series) are Compact executive cars which were produced by Alfa Romeofrom 1967 to 1977. The 1750 Berlina sedan was introduced in 1967, together with the 1750 GTV coupe and 1750 Spider. 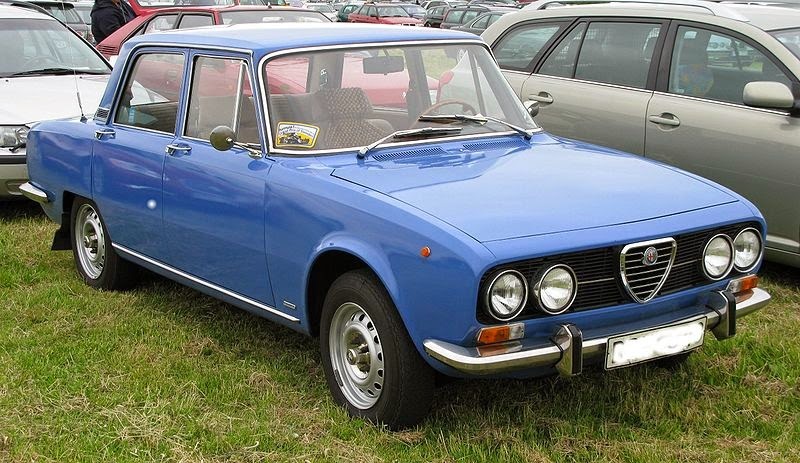 The 1750 models replaced the earlier Alfa Romeo Giulia Berlina. In contrast to the Giulia, the 1750s had reworked bodywork and bigger engine, shared many parts with other concurrent models in the Alfa Romeo range, but sold much less units during their production span. The 1750 Berlina was based on the existing Giulia sedan, which continued in production. The 1750 was meant to top the sedan range, above the 1,300 cc and 1,600 cc versions of the Giulia. In the United States, however, the Giulia sedan ceased to be available and was entirely replaced by the 1750 Berlina. The 1750 bodyshell had a longer wheelbase than the Giulia, and revised external panels, but it shared many of the same internal panels. The windscreen was also the same. The revisions were carried out by Bertone, and while it resembled the Giulia some of that vehicle's distinctive creases were smoothed out, and there were significant changes to the trim details. The car's taillights were later used on the De Tomaso Longchamp. The car has a 1,779 cc twin-carb engine and hydraulic clutch. The 1.8 L engine produced 118 PS (87 kW; 116 hp) with two twin sidedraught carburettors. For the US market the 1750 was equipped with SPICA fuel injection. In 1971, the 1750 Berlina was fitted with an experimental three-speed ZF automatic gearbox. The model designation was 1750A Berlina. According to official Alfa Romeo archives, 252 units were produced with very few surviving to this day. Some of 1750A Berlina didn't have the model plate with production date embossed. The automatic gearbox wasn't well-suited to the four-cylinder motor due to baulky shifting and ill-chosen gear ratio. Because of this, its fuel consumption was frighteningly high and acceleration was a bit too slow. In mid-1971 the 1750 series was replaced with the 2000 series. The Alfa Romeo 2000 Berlina was produced by Alfa Romeo between 1971 and 1977. The engine was bored and stroked out to 1,962 cc. A different grill distinguishes 2000 from 1750. Also, external lights were different between the models. The 1750 had 7 inch diameter outboard headlights, whereas the 2000 had 5 3/4 inch diameter in all four positions. The tail light clusters were also of a simpler design on the 1750. With two carburetors, this 2 litre Alfa Romeo Twin Cam engine produces 132 PS (97 kW; 130 hp). Top speed was 200 km/h (124 mph) and 0-100 km/h (62 mph) acceleration took 9 seconds. In USA this engine was equipped with mechanical fuel injection. Gearbox was 5-speed manual (also 3-speed automatic on some versions). The 2000 Berlina was produced in 89,840 examples with 2.200 units fitted with automatic gearboxes. Last updated on 9 April 2014 at 09:04.